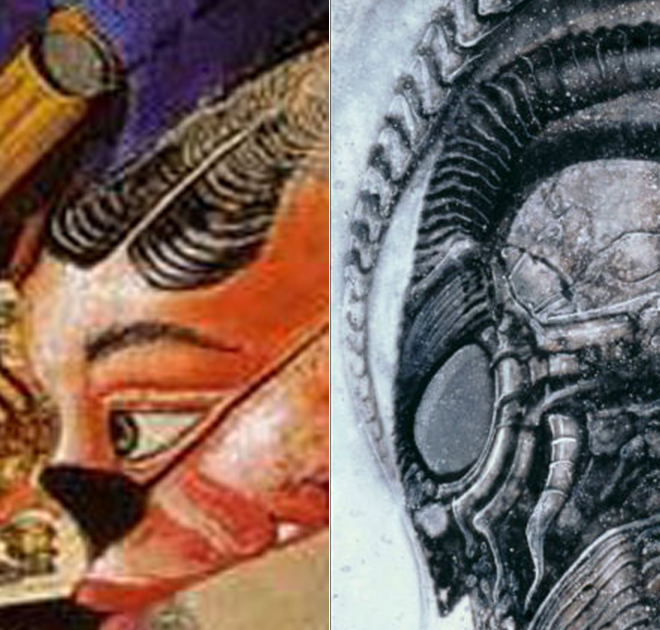 Alien Explorations: HR GIger's Necronom VII : based on ancient helmet, Doctor Who monster or both? 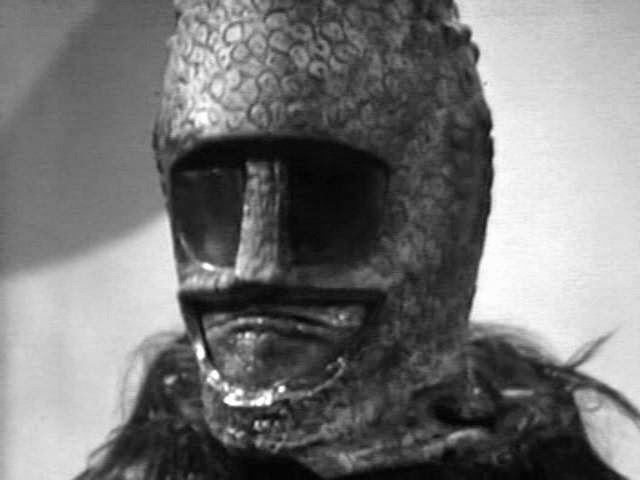 based on ancient helmet, Doctor Who monster or both? 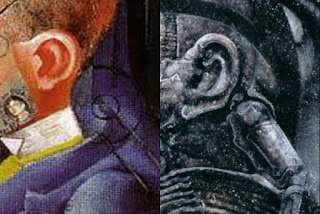 Necronom VII, a tall humanoid head with large goggles connected by a pipe roughly resembling a rams horn trailing around the back of the head and spines running down along the centre of the front of the skull, and it's nose almost flat ends with a sharp ridge. 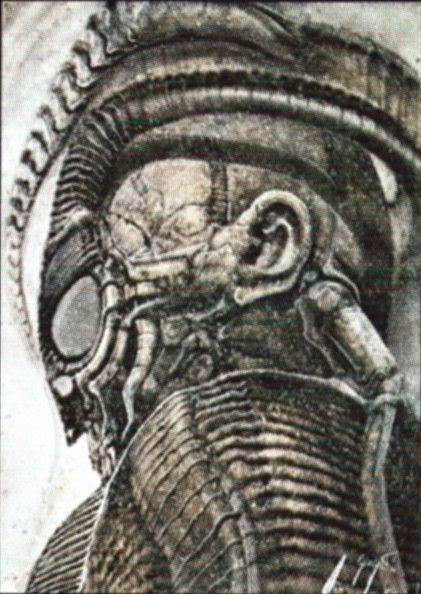 It is painted by Giger as one of his biomechanoids Also this entity has peculiar high shoulders which I started to wonder if it was a sort of a high collar. 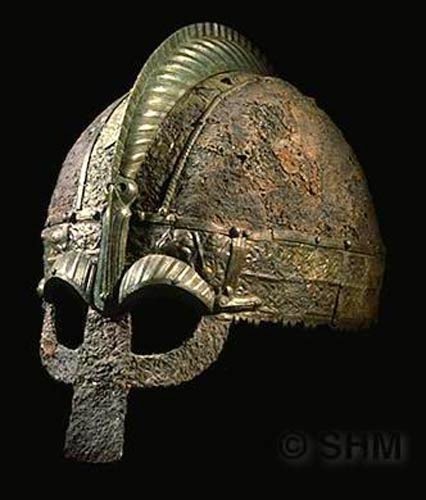 Helmet from Swedish Vendel era (550-790) Swedish Museum of National Antiquities. 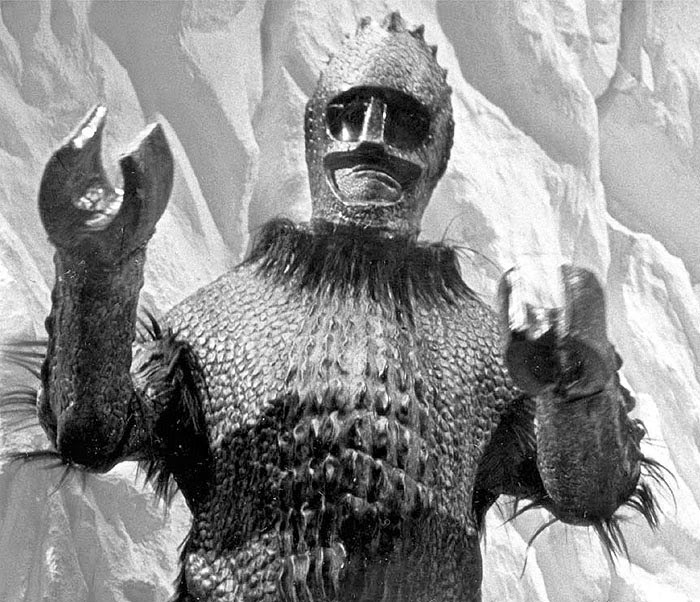 When Giger painted Aleph which I believe incorporated characters from the doctor who series "Curse of Peladon", there seem to be all the aliens and monsters from those episodes apart from the character known as the Ice Warrior. 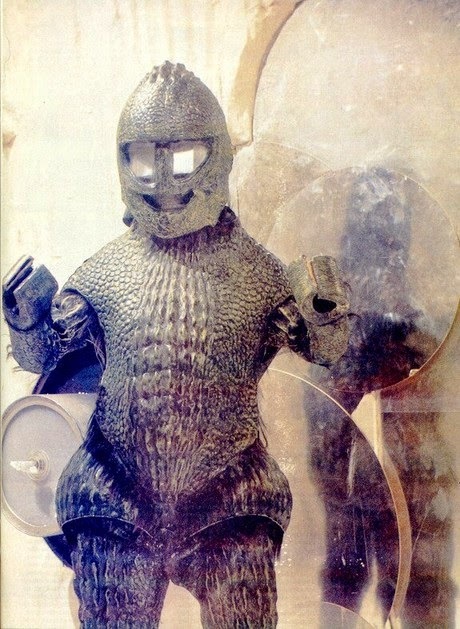 So if looking the general shape of the head, the eye goggles, the nose and the odd raised collar, I saw something enough of the form of the head of an Ice Warrior from that story which indeed loosely resembles a viking or anglo saxon helmet. (I made a connection on 15th September 2014 between the Ice Warrior and Necronom VII) This character makes it's first appearance in the Doctor Who story The Ice Warriors which appeared first on British TV in 1967 and then appeared in the Doctor Who stories The Seeds of Death (1969), The Curse of Peladon (1972) and The Monster of Peladon (1974). 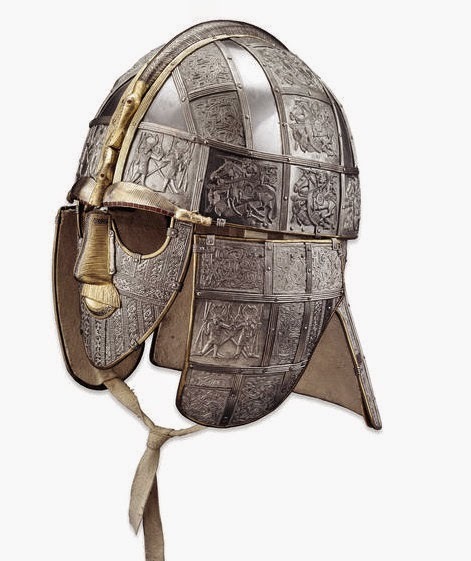 The head is loosely supposed to resemble an anglo saxon helmet. 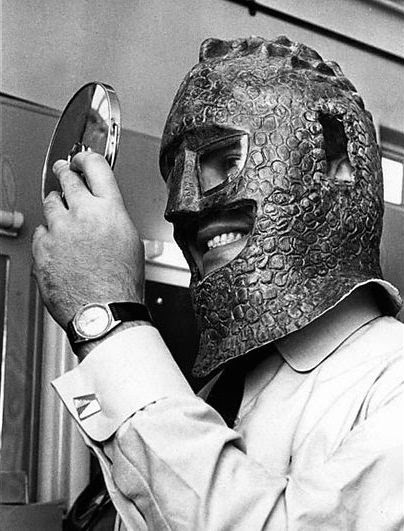 Bernard Bresslaw having the the mouth skin applied while wearing the helmet. 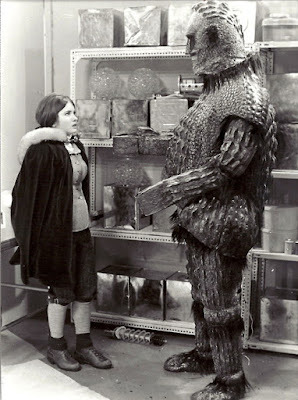 The Ice Warriors story includes the discovery of a strange huge monstrous humanoid body stuck frozen in a glacier, and when it is taken in doors and thawed out it suddenly comes to life once again. (See Wikipedia page for more information). The writer who invented them Brian Hales envisioned them as cyborgs which perhaps went too far in the direction of cybermen, and so the production department went a different direction with the design and made them into huge armoured reptiles, traces of their cyborg origins remained in the script and their suit that contained electronic items such as weaponry and helmet is discovered to have electronic connections and it's decided that it must be a sophisticated space helmet. 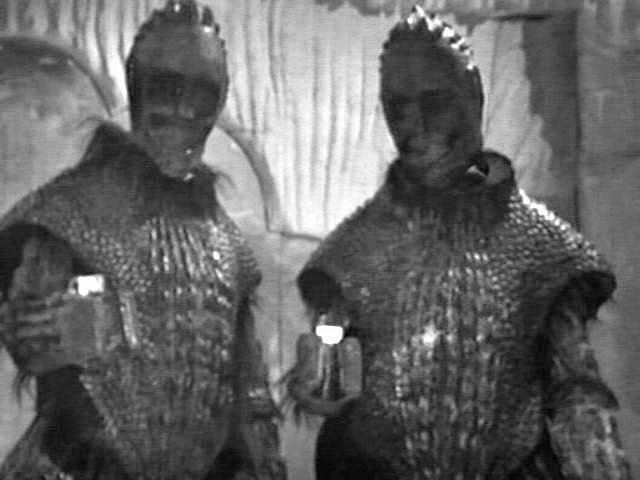 Their armour appears to be an organic shell, the design appears to a good example of the question "where does biology stop and technology begin?" This character so loosely resembling Giger's painting just so happens to generally fit into Giger's concept of the Necronom concept. 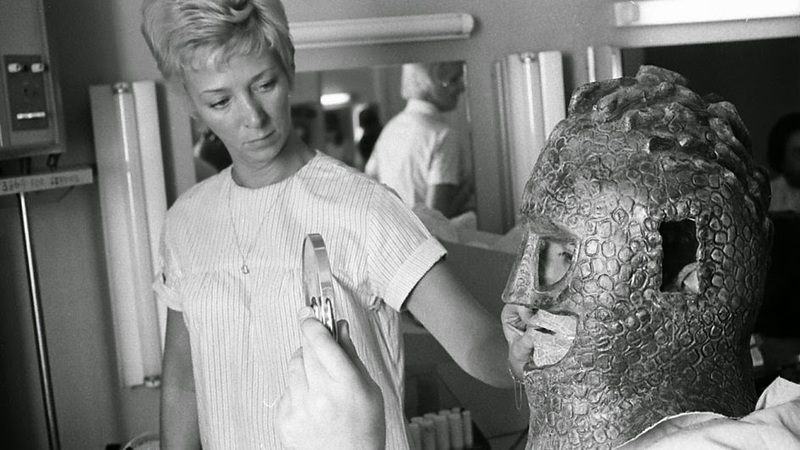 If Giger wanted to mix this character with ideas about viking helmets, that's another possibility. 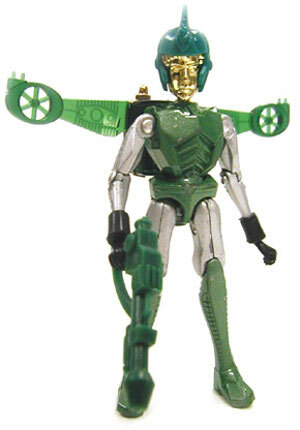 I've had the idea that the Micronauts Space Glider has a connection with Necronom VII, but with no certain ideas about how other than a suggestion of the helmet which has a fin on the top and that might be enough, as most of the Necronom series have something to do with the Micronaut toys. 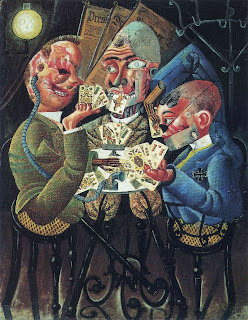 Saturday 8th July, 2017, I suddenly realised that various details from the Necronom VII painting also referenced Otto Dix's Skat Players again. It appears to be one of these paintings that intrigued Giger in different ways. The right man's parted hair become the ribbed horns of the creature. Perhaps the empty nasal cavity contributes to the idea of the visor. His back support becomes a limb connecting with the ear.